TOUCHING THE WALL – Alexander Petriw (front) finishes the 800-metre freestyle race ahead of Thomas Backica, at the Canada Games Centre. Petriw finished the race in a time of 9:21:27 a Ryan Downing Memorial Swim Meet record. The Ryan Downing Memorial Swim Meet took place at the Canada Games Centre over the weekend. The Ryan Downing Memorial Swim Meet took place at the Canada Games Centre over the weekend. 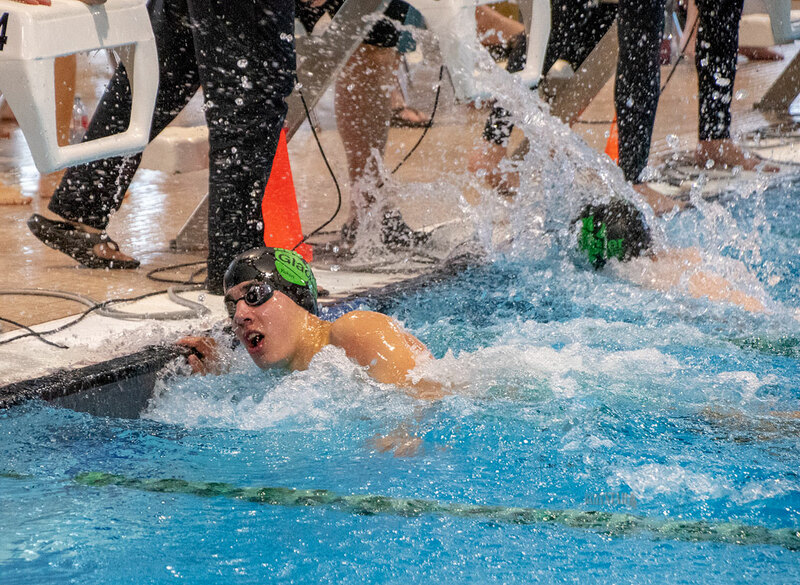 The meet had 116 swimmers, aged 7-17, from the Yukon and Haines Junction, competing in a variety of swimming events. The meet focused on the swimmers’ personal best times, award ribbons were given for every personal best time swam. Over the weekend five Meet records were broken, all in the boys 15-17 age category. The first record broken was by Alex Petriw in the 800-metre freestyle, finishing in a time of 9:21:27. Aidan Harvey broke the other four meet records; the first was in the 50-metre backstroke, finishing in a time of 29.88. Next was the 100-metre backstroke in a time of 1:03.95, the 200-metre freestyle (2:06.83) and the 400-metre individual medley (5:09.17). Malwina Bukszowana, head coach of the Whitehorse Glacier Bears, was pleased with the clubs overall performances, as the swimmers finished with very fast times. The meet also had visiting referee, Nancy Telford from Penticton, come down to the meet to teach officiating courses and mentor two swimming parents working towards their referee certification. According to an email from Lisa Harvey, meet manager, the Whitehorse Glacier Bear swim competitions and events are a true community partnership. “The parents are everything,” said Bukzowana.